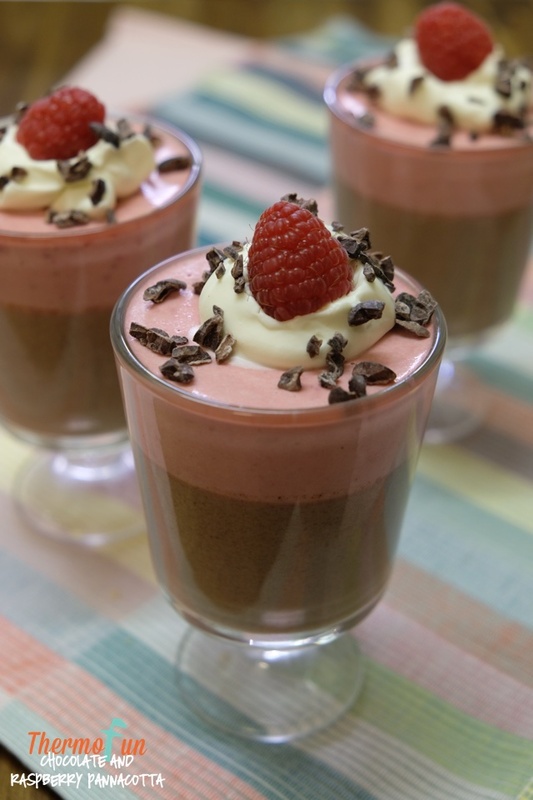 This thermomix chocolate and raspberry pannacotta is delicious! A very decadent dessert for those of you that are following the LCHF (low carb high fat) way of eating. I have a blog post listing some of my very popular LCHF recipes. Click Here to make your LCHF lifestyle simple and delicious! With many thanks to my dear friend Tania Lee for sharing this delicious recipe with us. For those of you following LCHF I have a special treat for you here that you can enjoy as an impressive but secretly easy dessert. I’ve used xylitol and have added the raw sugar option for those on an unrestricted way of eating. Feel free to use your own preferred sweetener. The tangy raspberry layer teams so well with the chocolate layer, and the crunchy cacao nibs sprinkled on top add a lovely texture to complete the dessert. Even though this makes a large quantity, they keep very well covered and refrigerated for up to a week. This recipe can also be used for variations. 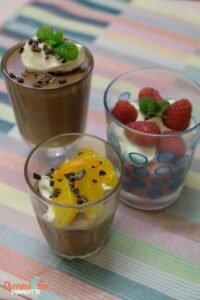 By using just the chocolate Pannacotta recipe you can easily make Choc-Mint Pannacotta, by adding a few drops of peppermint extract or oil. Or even Jaffa Pannacotta, by adding a few drops of orange extract or oil. Can also just use the Raspberry Pannacotta, can double up the quantity and serve it with a generous dollop of cream and fresh raspberries. Place xylitol (or raw sugar) into dry TM bowl and mill 10 sec / speed 10. In a small bowl dissolve the gelatine in the warm water and set aside for a few minutes. Add cream and chocolate and melt 6 mins / 50°C / speed 2. Once the cream and chocolate has melted together add the dissolved gelatine to the mixture and combine 30 sec / speed 2. Gently pour and divide the chocolate pannacotta mixture into 8 serving glasses, leaving space on top of each for the raspberry pannacotta layer. Refrigerate to set for min 2 hours. Once set, make the raspberry pannacotta layer. Add raspberries and purée 10 sec / speed 6. Add cream and vanilla and cook 5 mins / 50°C / speed 3. Add dissolved gelatine and mix 30 sec / speed 3. Gently pour and divide the raspberry pannacotta mixture on top of the 8 chocolate Pannacotta glasses. Serve with a dollop of whipped cream and the lovely crunch of a sprinkle of cacao nibs.